An expense is a cost incurred from work-related tasks and/or purchases (travel, meals, office supplies, etc.). Expenses may be non-billable or billable, the latter applying to expenses for a project funded by a specific client. 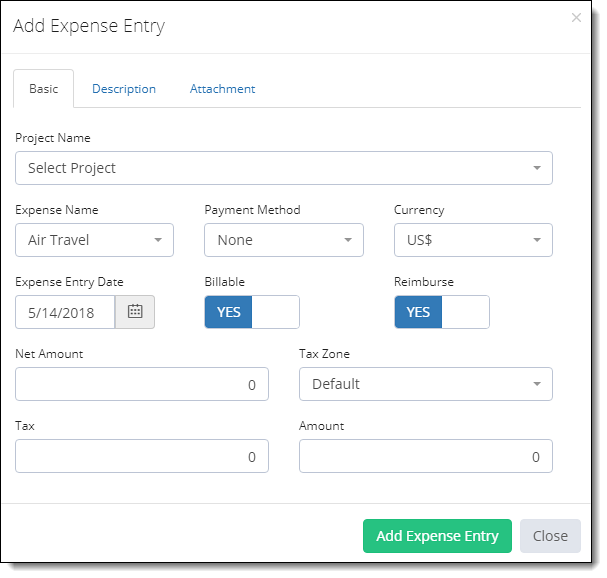 A single expense sheet allows a user to submit multiple expenses. User can print an expense sheet for the signature purpose. Click on the My Expenses/$ Icon from the left navigation bar. 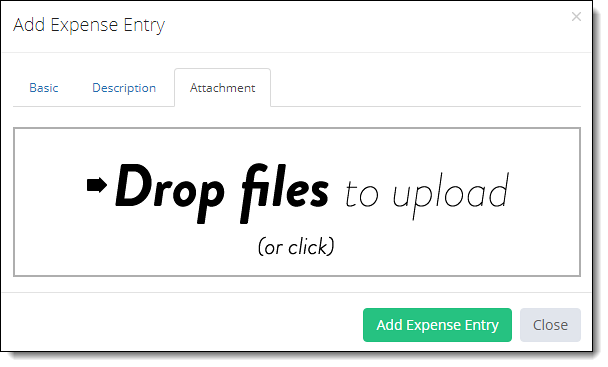 Click Add Expense Sheet green button on the top-right of the application and follow below steps for adding Expense Entry. Click Add Expense Entry green button on the top-left of the application. Payment Method (different available payment methods like Cash, Credit Card etc.). Reimburse (Yes/No) (if you paid for the expense and require reimbursement). Quantity (depends on Expense Type) (if this expense is configured to get input of quantity field). Rate (depends on Expense Type) (if this expense is configured to get input of quantity field). Tax Zone (depends on Expense Type) (will be appear only if this expense is configured as a tax able expense). Tax Amount (depends on Expense Type) (will be appear only if this expense is configured as a tax able expense). Fill the Description as per the requirement. Click on the box file to upload the related file. Click Add Expense Entry button. If you want to add another expense entry, please follow above process. 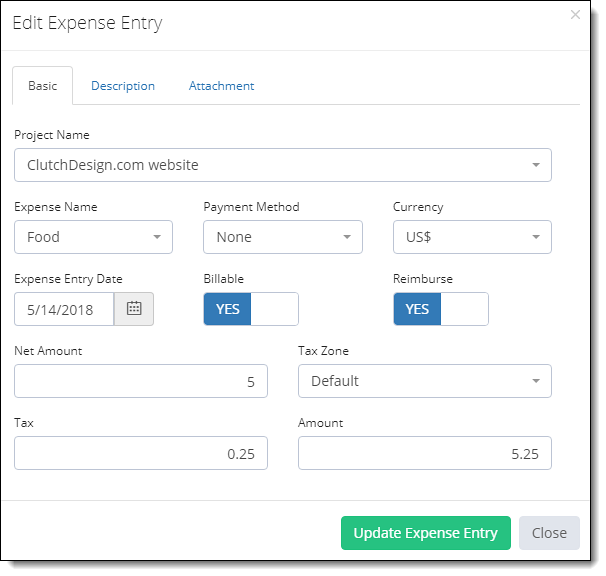 After expense entry, the user should navigate to the bottom of the Expense sheet page and fill the Expense Sheet Description. Click Submit blue button on top for the approval process. Scroll/search for the Expense Sheet which you want to Edit and click on the Options gear icon against it. Select Edit Expense Sheet option. 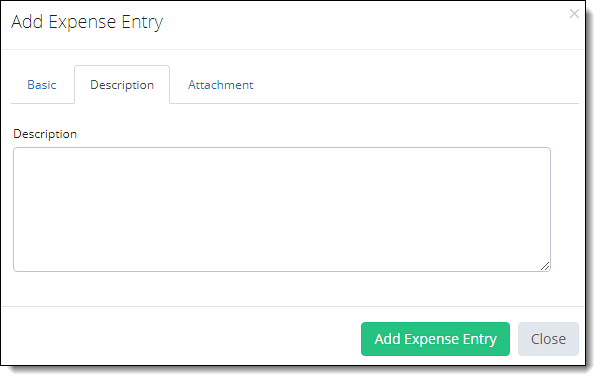 If you want to modify the expense entry, click the Options gear icon against the expense entry. Select Edit Expense option. Make changes as per your requirements and click Update Expense Entry. After making changes in the sheet as per your requirements, click Update Sheet Button. Scroll/search for the Expense Sheet which you want to delete and click on the Options gear icon against it. Click OK from popup for confirmation.